While we were setting up timelapse cameras at the Niobrara Valley Preserve a couple weeks ago, I had an encounter with a creature I’d never seen up close before. It was evening, and Jeff Dale was driving us down toward the river. Suddenly, he hit the brakes and backed up, saying he’d seen something up in a tree – maybe a raccoon. All three of us grabbed cameras and walked up the hill toward a small oak tree with a furry creature up in the branches. A furry animal in a small bur oak tree. The light was beautiful – as was the moon. 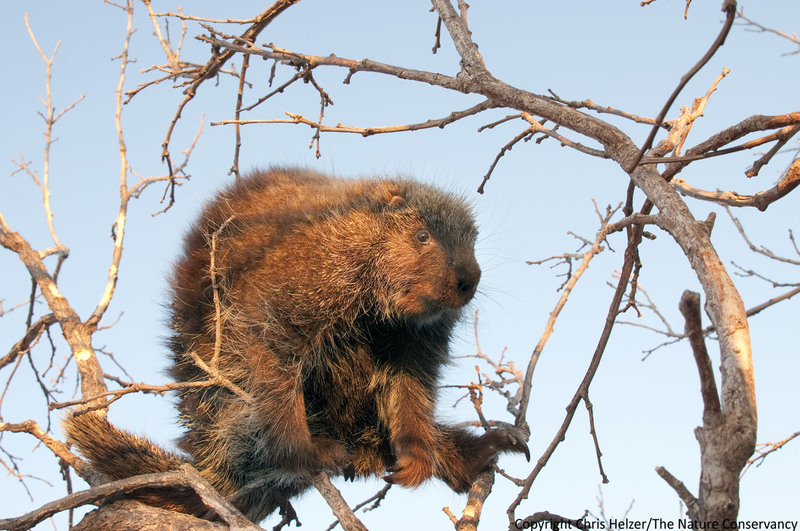 When we got closer, we realized it wasn’t a raccoon – it was a porcupine! In my whole life, I’d seen a couple dead porcupines along the road, and a couple trees that had been worked over by porcupines, but I don’t think I’d ever seen a live porcupine before – they’re just not very common in my part of the state. Once we figured out what it was, Jeff and David graciously let me approach the porcupine first. (Thinking back now, they may have just been waiting to see if I got a face full of quills…) The sun was on its way down and the light was beautiful. I snapped a couple photos as I approached in case it took off, but the porcupine didn’t seem inclined to run, and before long, I ended up right at the base of the tree. Because the tree was short, I could stand uphill and be at the same elevation as the porcupine. Face to face, you might say. However, it’s not accurate to say I was face to face with the porcupine because the porcupine was steadfastly looking away from me. I suppose that’s the right defensive strategy when your weapons are on your backside, but it made photography kind of a challenge… If I walked to south side of the tree, the porcupine would look north. If I walked to the north side, it would look south. It wasn’t moving quickly, but even if I ran to the other side, it would be looking away by the time I got there. As you might imagine, Jeff and David thought this was mighty entertaining. By this time, they’d sidled close enough that I could hear their chuckling. I told David to make himself useful and come help. I figured the porcupine couldn’t look away from both of us if we were on opposite sides of the tree. I was right about that – it just looked away from ME. David was apparently non-threatening, or at least less threatening than I was. Maybe that’s because it’s hard to seem threatening when you’re laughing as hard as David was. While David and porcupine shared their little joke, I was still left facing the backside of my intended photo subject. Here’s David Weber conspiring with the porcupine. You can tell by the grin on his face how bad he felt about the whole situation. After a few more minutes of jocularity, the porcupine did eventually turn my way. I’m not sure why – I suppose it probably figured I wasn’t going to leave it alone otherwise. Of course, when it DID look at me, its face was in the shadow of a tree branch. 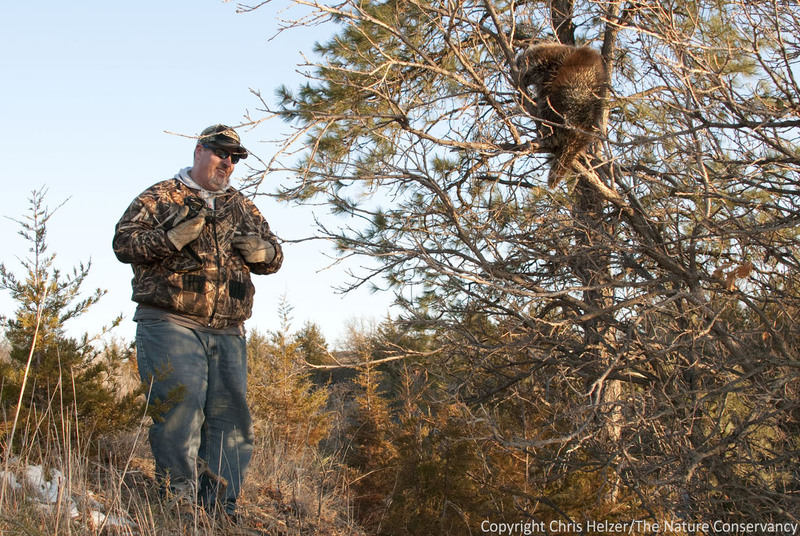 After all that trouble getting the porcupine to look in me in the face, I wasn’t going home with photos of a porcupine that looked like it had stripes on its face, so I called David into action again. Trying (unsuccessfully) to stifle his chortling, David grabbed the end of the branch and swung it around a little so the porcupine’s face came out of the shadows. …At which point, the porcupine looked back over at David and away from me. By this point in the story, some of you are probably feeling sorry for the porcupine. The poor thing had been sitting in a tree, just calmly chewing on a branch, when it was rudely accosted by a frustrated photographer and his two snickering friends. Now, one of the snickerers was swinging its branch around. Well, let me just say this: of the four of us, the porcupine wasn’t the one showing signs of stress. It seemed competely calm – content to play the straight man in the comedic sketch my companions were enjoying so much. Finally, between David’s branch maneuvering and my persistence (stubbornness?) I did end up with a couple halfway decent shots of the front side of the porcupine. One decent photo, even with the shadow arcoss its face. 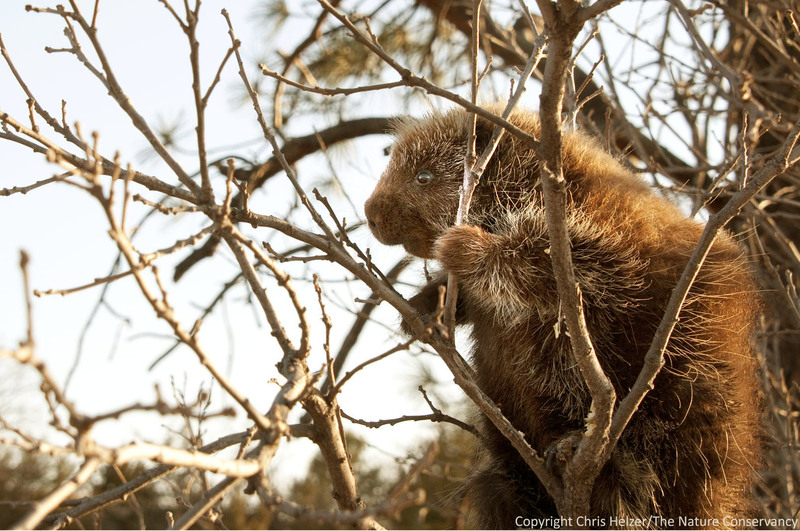 This entry was posted in Prairie Animals, Prairie Natural History, Prairie Photography and tagged bur oak, nature photo, nebraska, niobrara river, niobrara valley preserve, oak tree, photo, photography, porcupine by Chris Helzer. Bookmark the permalink. Beautiful shots! I commend you on your patience. It was worth it! How cool. I’ve never seen a porcupine. I don’t think they live in Illinois, well at least not in northern Illinois. I also didn’t know they chewed on trees. I enjoy reading your blog because I always learn something new. Thanks. i used to live in peoria–we hiked practically everywhere in central illinois and certainly never saw a porky! if they live anywhere in ill. it would be in far northern Illinois…keep looking up in the trees, cuz that is what they eat! I love this post!!! great job getting your pics, we live close to the foothills of the adirondacks here in syracuse; porkies are here – and they are so darn cute…as you determined! we located one in the top of an aspen, just chomping happily away, despite that there were 6 of us gazing from the foot of the aspen. they are really calm, the word phlegmatic comes to mind. i didn’t know you had any out there…congrats!!!! 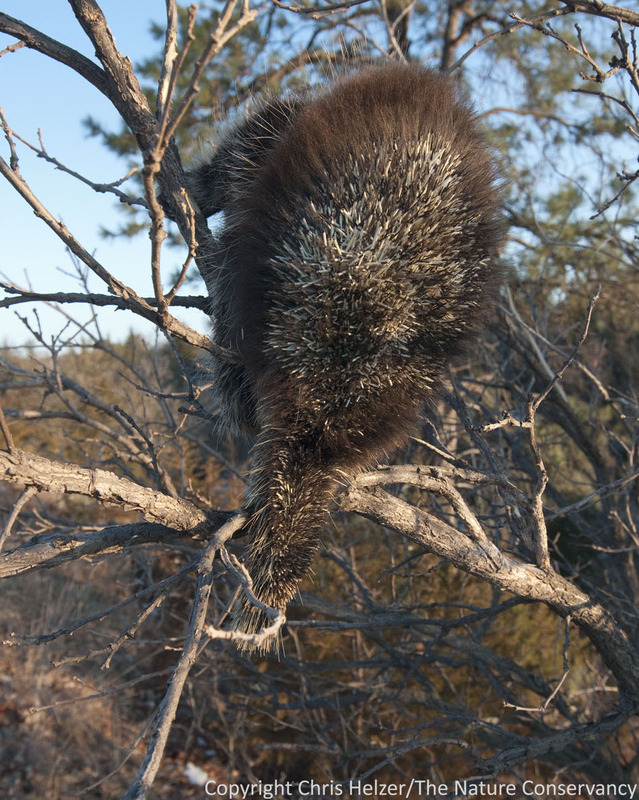 I’m far from an expert on porcupines, but I would be surprised if this one had been impacted by the wildfire. I think that is just the way the quills on the back look. In my 72 years the last pair of these are the best photos of a porcupine I can remember ever seeing in that this porcupine clearly has a personality. And a good sense of humor! Thanks for sharing, and keep up your wonderful work. These are so great! I have never seen one, though did see all their work on some trees at your Niobrara Preserve, and have some quills from African forests. It’s adorable! Thanks so much for sharing!! Great story — little humor is always good. I’ve seen a porqupine at a distance but not upclose. I have never seen a porcupine in person either. Kind of a cute critter, isn’t he? Loved the pictures and thank you for posting them. In the northern Adirondacks I had a porcupine walk up to me. As soon as he saw me, he flared his quills and started shaking his tail. I took two quick steps back. The porcupine then lifted his chin up and shrugged his shoulders as if he was thinking “I showed him!” He then went down to the stream and started chewing on sedges. I had a number of encounters with porcupines. I once found a porcupine in a tree adjacent to my tent after I had woken up. Another time I found a feisty porcupine in a rocky area it was using as a den. My encounter with the porcupine by the stream was the one that seems the most remarkable. Chris: Great images, but you have got to keep better company. Great photos Chris! When I worked at NVP I walked up on a porcupine and had the urge to get some quills. It was waddling away into the woods so I had to think fast and the only thing I thought of was to was throw one of my leather gloves at it’s backside, thinking it would leave some quills in the glove. Instead, the glove stuck to it’s backside and it kept waddling away. Doh! It eventually wedged itself deep into a tangle of cedar tree blowdown – face first with just it’s backside, and my glove, facing out. I had to crawl in there and pry the glove off with a long stick, but I got quite a few quills. Another time I came across one out in the middle of the bison pasture, very very far from any trees. It was heading south and I guess if it kept going it would have hit Plum Creek. Plenty of trees there but an awful long way to go for a slowpoke. How wonderful! It is so exciting to see an organism live in the wild for the first time. In central Texas, porcupines are very rarely seen. Dogs find them first, unfortunately for them. The quills that I’ve examed seem to turn a yellowish color at the ‘business end’ and have to be surgically extracted. Great photos! Yep, that is a smug mug. My dad used to go hunting somewhere in western Ne. He brought us back some porcupine quills once. My daughter was in Fairbanks, as a vet., she had to remove quills from dogs many times. My sister sent me this post and I am so glad she did! As someone who hikes with dogs, I’ve seen their handiwork but I have to keep my distance from them. When other hikers ask me why I keep my dogs on leash even in the middle of a national forest, my first answer is ‘bears’ and the second answer is ‘porcupines’. Those are good shots. Their primary food is tree bark, which is why so many people hate them here where Timber is King (Olympic Mtns), but they also eat herbaceous stuff. I once saw one in a stunted willow tree in the middle of the sagebrush desert of eastern Washington, where there’s no trees outside of irrigated areas, and I was told that they eat the wheat in the agricultural fields.